Attorneys General Sue Trump Administration To Block 3D-Printed Guns The lawsuit is seeking a temporary restraining order to bar the government from lifting export control restrictions and stop a company from posting downloadable gun plans online later this week. 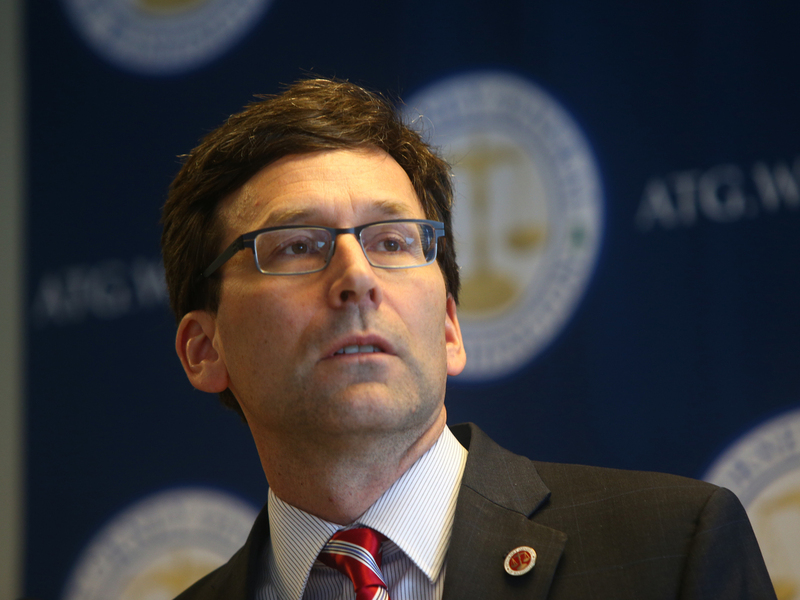 Washington state Attorney General Bob Ferguson, pictured in 2017, is leading a multistate lawsuit to prevent 3D-printer gun plans from being published online. Defense Distributed announced it plans to make 3D gun blueprints — including a single-shot pistol called "The Liberator," an AR-15 lower receiver, and a complete Beretta M9 handgun — available on Aug. 1, after reaching a settlement with the federal government. It was the conclusion of a five-year legal battle in which the Obama administration had argued that the Internet tutorials and manuals violated firearm export laws, while the company's owner, Cody Wilson, alleged that the State Department was violating his First Amendment right to free speech and Second Amendment right to bear arms. The two sides reached an agreement in June but details of the settlement didn't emerge until mid-July. In addition to granting Wilson permission to publicly release the files online, the government agreed "to pay nearly $40,000" in legal fees for Wilson, according to The New York Times. Shortly after the victory, Defense Distributed declared on its website: "The age of the downloadable gun formally begins." President Trump weighed in on the matter in a tweet. "I am looking into 3-D Plastic Guns being sold to the public," he wrote. "Already spoke to NRA, doesn't seem to make much sense!" In response to Trump's tweet, Senate Minority Leader Chuck Schumer, D-N.Y., added: "Your administration approved this. What kind of incompetence and dangerous governing is this?" The new lawsuit against the State Department was filed in Seattle, Wash., federal court by Washington state Attorney General Bob Ferguson, along with New York, New Jersey, Massachusetts, Connecticut, New Jersey, Pennsylvania, Oregon, Maryland and the District of Columbia. Ferguson has asked the court for a nationwide temporary restraining order to bar the administration from lifting export-control restrictions, a decision he contends is an "about face" reversal from the department's previous position. And, he is seeking "to prevent Defense Distributed posting the downloadable guns online." He also argues that the State Department's actions violate the Administrative Procedure Act, by neglecting to inform Congress of the changes, in addition to state's rights under the 10th Amendment. "I have a question for the Trump Administration: Why are you allowing dangerous criminals easy access to weapons?" Ferguson asked in a statement Monday. "These downloadable guns are unregistered and very difficult to detect, even with metal detectors, and will be available to anyone regardless of age, mental health or criminal history. If the Trump Administration won't keep us safe, we will." The complaint alleges that the public availability of the gun plans poses a "serious threat to the national security and public safety" of citizens. "3-D printed guns are functional weapons that are often unrecognizable by standard metal detectors because they are made out of materials other than metal (e.g., plastic) and untraceable because they contain no serial numbers. Anyone with access to the [Computer Aided Design] files and a commercially available 3-D printer could readily manufacture, possess, or sell such a weapon—even those persons statutorily ineligible to possess firearms, including violent felons, the mentally ill and persons subject to protection and no-contact orders." "We won't stand by as New Yorkers' safety is jeopardized by this abrupt about-face by the federal government," she added. Twenty-one state attorneys general signed a letter to Attorney General Jeff Sessions and Secretary of State Mike Pompeo urging them to withdraw from the settlement. Wilson responded to the latest legal battle on Twitter calling on Second Amendment advocates to fight for their online rights. "This is the fight," he said. "Join me." "We are prepared to litigate," Wilson told CNET in an emailed statement. "The American people have the unquestionable right to access this information."